GSMArena team, 03 August, 2015. 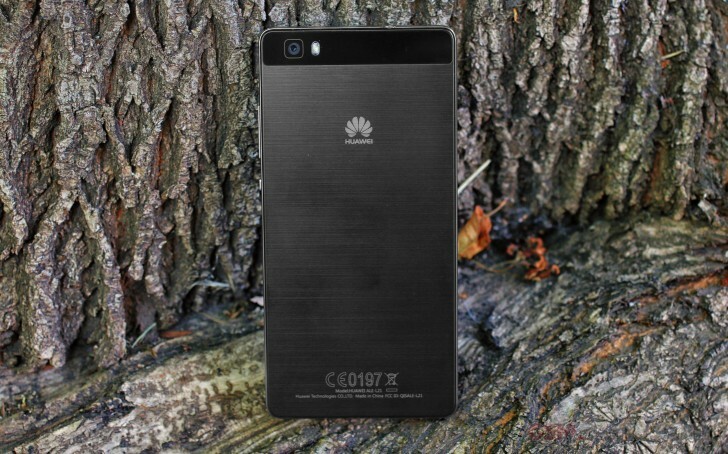 The Huawei P8lite is powered by a home-brewed HiSilicon Kirin 620 chipset. It is equipped with a total of eight Cortex-A53 processors, all clocked uninspiringly low at just 1.2 GHz. This is actually concerning for two main reasons. One, Huawei's Kirin chipsets have a really bad reputation of underperforming and two, the chip in question is significantly less-powerful and also older than the Kirin 930 inside the Huawei P8, which didn't do too well in our tests itself. This all spells out major trouble for the P8lite. But the aforementioned Cortex-A53 cores might not even be the biggest problem the Kirin 620 is facing. It is bundled with a Mali-450MP4 GPU, which is far from competitive in today's mid-range market. Still, we will be happy to pit the P8lite against some viable competitors and hope that the Kirin chip will surprise us for a change. Like we already mentioned, the US version of the Huawei P8lite, bearing the model number - ALE-L04, is equipped with a more standard Snapdragon 615 SoC in place of the Kirin chip. It is currently the definitive and probably most popular mid-range option and we were quite pleasantly pleased to find that in most of the CPU-related tests, the Kirin scored pretty close to the Qualcomm alternative. We have included our benchmark results for the Snapdragon P8lite in the tables as well and will comment on some particular points later on. There is yet another mishap that seems to occur every time we review a Huawei device (one with a Kirin chip that is). At least a dozen models have passed through our office and consequently - the testing procedure and yet, we never seem to get two devices with the same chipset. As you can imagine, this mostly limits our ability to judge how well said SoC was implemented in a given device. As it so happens, there are two other devices in our database with the Kirin 620 chip - the Huawei Honor 4X and Honor 4C, yet sadly, neither have paid a visit to the office. Thus, we are left with only one option in terms of similar hardware performance comparison and that's pitting the Kirin 620 against whatever other Kirin we can find, like we did with the P8. The closest we have managed to come is the Huawei Ascend Mate 7, with a Kirin 925, the Huawei Honor 6 - with a Kirin 920, the P8's predecessor - the Ascend P7, which runs on a Kirin 910T and the P8 itself (Kirin 930). We have included them in our comparison as reference points for how the P8lite compares to the rest of Huawei's lineup. As far as the other chosen competitors, the Huawei P8lite happens to sit in a pretty mid-range price bracket. With an asking price of €250 - €300, there are a lot of viable alternatives to suggest and some veritable competitors to take on. It is also worth noting that the P8lite goes for about €200 less than the premium P8, which is quite an impressive price drop, while still maintaining the general style and premium look and feel of the model. Just a small note, the new EMUI 3.1 is based on Android 5.0, so, we would expect that the P8lite has all the benefits that the new code brings about at its disposal. So, to be fair, we have included, where possible, Lollipop benchmark scores for any other device on the list that has already received an update. First up, we have the raw CPU performance test with GeekBench 3, which should be straight-forward enough. Having eight cores is a definite plus, but with a clock speed of just 1.2 GHz, performance is not stellar. Still, the Huawei P8lite did manage to score surprisingly well in the pure computational department. Naturally, it got surpassed by the P8. Also the Acer Liquid Jade S did noticeably better, which is all but expected since it uses the Mediatek MT6752M, or in other words the very same eight Cortex-A53 cores, just clocked at 1.5 GHz. The situation is pretty much identical with the Meizu M1 note, which also has eight Cortex-A54 cores, but working even faster at 1.7 GHz. As for the Snapdragon 615 version of the P8lite, it sits pretty close to its sibling, so it appears the combination of four Cortex-A53 cores at 1.0 GHz and another four and 1.5GHs is pretty comparable to a 1.2GHz eight-core setup. The Qualcomm ship scored only slightly lower than the Kirin 620. However, it is interesting to note that the Kirin 620 does seem to perform better, in terms of raw CPU power than the Snapdragon 615 in the Xperia M4 Aqua for example. It uses the very same number and type of ARM cores - four of which at 1.5 GHz and the other at 1.0 GHz. AnTuTu is a compound benchmark, which also takes into account RAM and GPU performance. Here we see pretty much the same arrangement, only this time, the Huawei P8 takes the cake. Like we already mentioned, this test is a lot more-subjective and easily influenced by any number of hardware and software factors of a given handset. For instance, the Mali-450MP4 GPU inside the P8lite surely brings down the score a notch. On the other hand, a custom OS like MIUM 3.1 is another huge factor and it could swing things both ways in terms of overall performance. Still, we are pleased to find the P8lite towards the upper end of the chart, so there might be hope for the Kirin 620. Furthermore, its Snapdragon 615 sibling once again scores a close second, confirming once again that whatever Huawei managed to do with the Kirin 620, it is, in fact, nothing short of a capable mid-range chipset. Moving on to Basemark OS II, which is a truly all-round benchmark. Here, we get a first sight of the P8lite doing poorly in the overall scores. The result is most-likely due to the already mentioned poor GPU, which drags down the otherwise excellent number-crunching power of the eight core processor setup. It is also worth noting that the P8 had trouble with this particular test as well, so there might be some software optimization issues at play. Still, the handset is a long way away from the bottom of the chart and definitely holds its own. Plus, as we can clearly see from the detailed single and multi-core performance charts, the low clock speed of the individual cores might have had a major influence on the overall score. This 1.2 GHz bottleneck is something to be weary of, as any app running on a single core will inevitably be limited in performance accordingly. This is where the Snapdragon 615 US P8lite gets a chance to shine. Thanks to its better Adreno 405 GPU, it did noticeably better in the graphics department, thus bumping up its overall Basemark OS II score significantly. This explains the substantial difference in the overall chart position and the almost identical results in the single and multi-core test breakdowns. Graphics performance is where things definitely get rough. We already mentioned that the Mali-450MP4 is hardly a powerhouse, yet, surprisingly enough, it seems to perform better than the Mali-T628 MP4 inside the P8. This, however is mostly due to the fact that the latter is deplorable, especially on a FullHD screen. That is another advantage the P8lite has in this case - the 720p screen does help boost framerates quite a bit. There is another troubling observation to be made here. The Ascend P7 uses the very same Mali-450MP4 GPU and even has a Full HD screen. Yet, it scores only a couple of frames less than the P8lite in an onscreen test and better in the respective offscreen benchmark. This leads us to believe that there might be some severe optimization issues, most-probably related to the new EMUI 3.1 and the adoption of Android 5.0 Lollipop. Furthermore, we couldn't even manage to run a GFX 3.0 test on the Kirin chip. Hopefully, these issues will be ironed out in the future, as the poor performance is really unexpected, even for the Mali in question. The Snapdragon 615 version, on the other hand offers a very different graphics experience. Thanks to its superior Adreno 405 GPU, it managed to capture fourth place in the offscreen test and even top the onscreen one. It also had no problem running the GFX 3.0 Manhattan test, unlike its Kirin counterpart. Speaking of poor OS optimization, there seems to be a lot more of it in terms of browser performance. Bear in mind, however, that the below scores are from the bundled default browser, which does seem to be based on Chrome, but an older version. Chrome, which is also included out-of-the-box does a significantly better job. It is also worth noting that the Snapdragon 615 variant of the P8lite didn't really do a lot better in this department, so we point the finger squarely at the browser. The Huawei P8lite benchmark performance is a mixed bag and not surprisingly, suffering from the choice of custom hardware. This, however, is only part of the story. Kirin chipsets have historically been bundled with rather meager GPU's and this one makes no exception. Still, the Kirin 620 does hold its own within its respective price range. This is a lot more than can be said for the P8, which simply seems to pricy for its own good. The P8lite can hold its own against the competition and despite the cited scores, the phone breezes through everyday tasks with no noticeable delay or stuttering in the UI. The 2GB of RAM without a doubt helps in this respect too. The US version fixes a lot of the GPU problems, so perhaps you are better off picking up a Qualcomm-powered unit - even at Android 4.4.4. Still, the international Kirin one is really not that bad, contrary to a lot of Huawei's past reputation. You really won't regret either choice for a mid-range android phone. Adapting EMUI for the Android Lollipop has taken its toll on GPU performance, which will hopefully be fixed come future updates. Still, if you are keen on doing a lot of graphics-intensive 3D gaming, or CPU-heavy work, the Huawei P8lite shouldn't be your first choice. For all other purposes, however, the device is fluid, responsive and a pleasure to use.